"Tiger Mom” study shows the parenting method doesn’t work. The first major study of tiger moms is out. The kids have worse grades, and they are more depressed and more alienated from their parents. 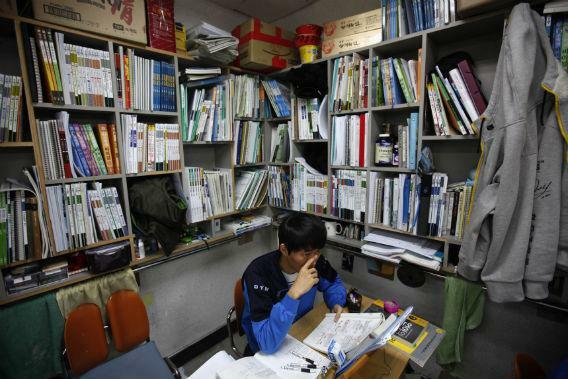 A student takes college entrance exams. What does research say about tiger parenting? When Amy Chua’s book, Battle Hymn of the Tiger Mother came out in 2011, it sparked controversy among many people but especially psychologists and experts in child development. The book, they felt, had lodged in the culture certain stereotypes about an Asian parenting style that was not well-studied or well-understood and certainly not ready to be held up as some kind of model. Chua’s book was a somewhat tongue-in-cheek memoir of her experiences raising her two daughters with her (non-Asian) husband, which involved hours of forced music practice every day, severe restrictions on extracurriculars, outright bans on social activities like sleepovers, and punishment and shaming on the rare occasions her children failed to attain their mother’s high expectations. Chua eased off as her kids grew older, and she admitted that she might have been wrong in some instances. (Mainstream media coverage portrayals were somewhat less nuanced). Nonetheless, the story of a Yale-professor mother who had pushed her child until she landed at Carnegie Hall seemed to confirm that Asian-American parents are tough, demanding—and they consistently produce whizzes. Kim wanted to look at a particular paradox that had emerged in the academic literature regarding Asian-American parents. When she began, of course, the term “tiger parent” didn’t exist, but scholars had the same impression as average Americans, that “Asian-American parents are more controlling, yet their children are also doing very well academically,” Kim recounts. This was somewhat of a mystery because it contradicted the experience of European-American children; overly strict and unresponsive white parents typically produce messed-up losers. Kim did not feel that any of these descriptions quite matched what she had experienced growing up. “Whenever scholars compare European-American and Asian-American families,” she said, parents among the latter “almost always score higher on controlling and lower on warmth, which means they’re more likely to be classified as authoritarian.” Yet, their kids were outperforming whites in school. This gave rise to the “achievement/adjustment paradox”: kids doing well by external measures while feeling torn apart inside. Kim decided that for her study, she would both parse further the different dimensions of the Eurocentric profiles and create new ones that better fit the styles of the East Asian families. The responsiveness that’s considered an aspect of “authoritative” parenting, for example, was broadened to include both positive and negative attributes: warmth and hostility. Control, she would write, has “multiple facets … positive control is measured by parental monitoring and democratic parenting; negative control is measured by psychological control and punitive parenting.” Kim also added inductive reasoning, which is a measure of effective communication, and shaming, which had been established in the literature as a significant aspect in the rearing of Chinese-origin kids. Adolescents and parents rated the parents on several qualities, for example, “act loving, affectionate, and caring,” “listen carefully,” and “act supportive and understanding.” Warmth, reasoning, monitoring, and democratic parenting were considered positive attributes, while hostility, psychological control, shaming, and punitive measures were considered negative. These characterizations would be combined through a statistical method known as latent profile analysis to determine Kim’s four parenting profiles: Those scoring highest on the positive dimensions were labeled “supportive;” those scoring low on both dimensions were deemed “easygoing;” “harsh” parents were high on negative attributes and low on positive ones, and “tiger” parents scored high on both positive and negative dimensions. Kim also measured the outcomes for each of her categories. Supportive parents had the best developmental outcomes, as measured by academic achievement, educational attainment, family obligation (considered positive outcomes), academic pressure, depressive symptoms, and parent-child alienation (considered negative).Academic achievement and attainment were purely data-driven, while the latter four came from different assessments developed by academics over the years (the academic pressure rating is Kim’s own), which, while considered reliable, are inherently somewhat subjective. Children of easygoing parents were second in outcomes, while tiger moms produced kids who felt more alienated from their parents and experienced higher instances of depressive symptoms. They also had lower GPAs, despite feeling more academic pressure. And although Chua presented her own children as Exhibit A of why her parenting style works, Kim said, “Our data shows Tiger parenting produces the opposite effect. Not just the general public but Asian-American parents have adopted this idea that if I’m a tiger parent, my kids will be whizzes like Chua’s kids. Unfortunately, tiger children’s GPA’s and depressive symptoms are similar to those whose parents who are very harsh. Correction, May 10, 2013: This article originally and mistakenly stated that the study controlled for sibling order.